WHITECOM Project Experience offers trainings, audits, project management, PMO implementation along with portfolio management software, coaching and mentoring for project managers, and advisory services. Our aim is to provide integrated services in the project management and project portfolio management (PMI®). 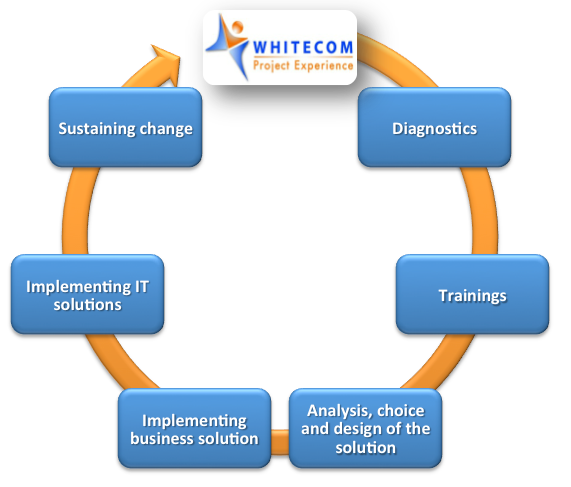 WHITECOM Project Experience's owner and director - Maciej Bodych – is an experienced project manager, holder of numerous certificates: project management (PMP® Certificate); quality (Six Sigma, ISO), software engineering (RUP), IT tools (IBM Rational); trainer, speaker at project management seminars. Sound experience in managing various projects; Project Management Offices implementation; evaluation of project maturity of Our Clients' organizations inspired him towards establishing WHITECOM Project Experience. The company supports its Clients by optimization of their development through projects, processes and implementation of IT tools. We invite companies willing to increase its effectiveness through the cooperation with our company. We provide integrated services – we claim to be the sole company on our market with such a broad range of project management products. Our services portfolio is adjusted regularly to the current requirements of the market based upon suggestions from our clients. In case of any questions to us regarding our services please contact us.